Harvard Air Learning Systems is dedicated to the fair, effective and efficient delivery of flight training services to its customer and educating a safe and knowledgeable pilot. "Float flying in Canada is 80% seamanship and 20% airmanship." ? Are you using a checklist? Checklists are an important tool in the cockpit, especially for amphibious aircraft. If you are not using one now and are wondering where to start, give me a call. I would design one that works for you. Why Should You Use A Checklist? Almost every analysis of aircraft accidents points to the need for better use of checklists. An analysis of incident reports of NASA's Aviation Safety Reporting System yields the same conclusion. Crew failed to use the checklist. Crew overlooked item(s) on the checklist. Crew failed to verify settings visually. When the crew was nearing the end of the work day. When the crew was rushing to make a scheduled departure time. When the crew, though not having completed all checklist items, nevertheless accepted a take-off clearance because departure traffic was backed up behind them. NEW ! VIDEO - Amphibious aircraft landing on water with the landing gear selector in the DOWN position ! So why should I use a checklist? Download this MPEG video to find out why. This is a 2 Mb file so make sure you have a high speed DSL connection or be patient waiting for the dial-up to process it..
Click here to land on water with your wheels down! These lucky lads were shaken (not stirred) and thankfully, no one was killed ! This video clip is the best argument for incorporating an IN-RANGE check during your approach checks. This course is designed for pilots holding float ratings and who wish to fly the experience of the Canada's legendary de Havilland DHC-2 Beaver or for commercial pilots looking for advanced training. 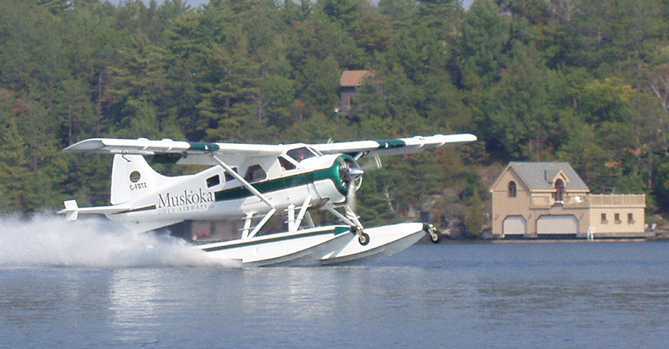 The aircraft will be available in May 2006 for training and will be based in Muskoka. Training is divided into ground and air components which includes airframe, engine, ancillary controls, performance, weight and balance subjects. Engine handling is emphasized in the air component as our DHC-2 is equipped with a Pratt & Whitney Canada R985 radial engine. We offer block time purchases in blocks of three (3) and five (5) hours. Call us for pricing and further information. The course content is designed to prepare an IFR initial candidate for the Transport Canada knowledge requirement for the writing of the INRAT examination. IFR rating renewal ground schools are now running on a regular dates. The course content is designed to prepare an IFR Renewal candidate for the IFR flight test environment and its skill level requirements.